In case you haven't noticed, my blog has had a fabulous makeover - Thanks to my wonderful Fiancé, and I love it so much! But in other news, I recently took on my biggest baking challenge EVER. I am the ultimate DIY bride, for a few weeks I was even considering making my own wedding dress. Now, I'm very glad I didn't though, with only 3 months left the stress of getting everything done has been getting to me. And I can't justify spending over R5000 for a cake. a Cake. As in something that will be eaten and digested. No thank you. The cost of the ingredients for all 3 tiers of our wedding cake was just under R600 so far (it's a fruit cake), that is excluding the marzipan and fondant icing that we'll buy when I'm ready to start decorating the cake (heart palpatations). But all costs included, the price for my entire wedding cake will be less than R1000. The actual baking of the cakes was hard work, like real hard labour work - I'm not even exaggerating! 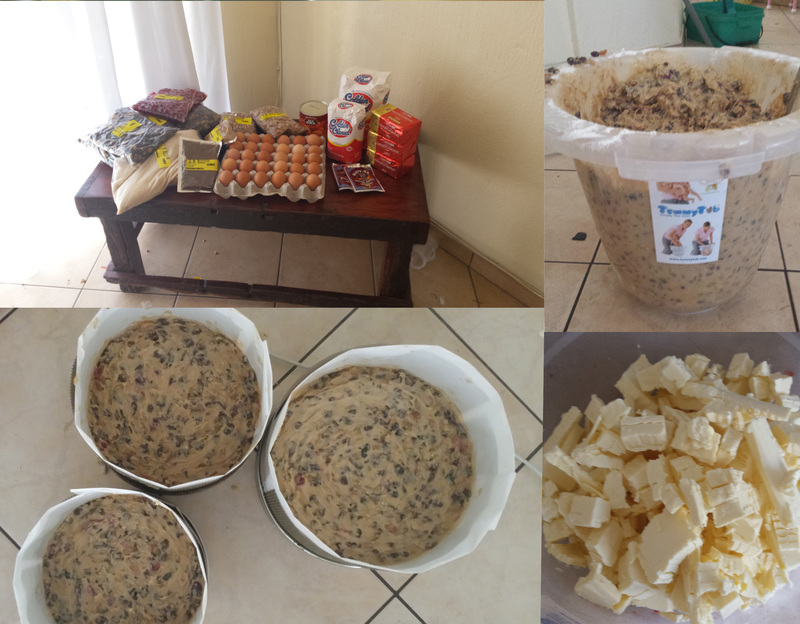 I had to mix, only naming some of the ingredients, 36 eggs, 7.5kg fruit, 2.5kg sugar and 2kg of butter together - BY HAND. I started out with y electric beater, but the poor thing wasn't up for the job. It sounded like a fat man on a scooter trying to drive up a hill. For a second there I thought it was going to start sparking and go up in flames. So I ended up doing it with a wooden spoon. It was time consuming and messy and stressful, but oh so satisfying to see the end results. The cakes are now safely stored on the top shelf of a wardrobe, where they will be fed with brandy (one shot for the cake - one shot for me) for the next 2 months. I will start decorating the cake a month before our wedding. I can't believe I'm only 3 months away from marrying the man of my dreams, I can't wait! 0 Responses to Baking My Own Wedding Cake!